Top 2 Names - One Day Left to Vote! Top 2 Names – One Day Left to Vote! It has been a tight race with a lot of amazing suggestions. Thanks to everyone who participated so far! 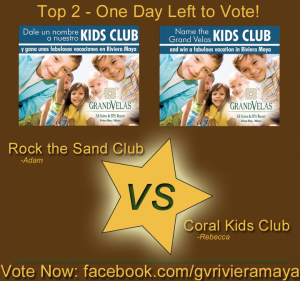 As we enter the final 24 hour period of voting for our Name Our Kids Club contest, two entries stand out as the leaders of the pack. These two options are within 7 votes of each other, and they are both leading by over 300 votes. The contest is far from over, however! Entry #5 was only submitted three days ago, and is making some impressive strides into the top standings. If you have submitted an entry, this late arrival of Grande Isla Bonita Ninos proves that it’s anybody’s game! So tell all your friends to click here to become a fan of our page on Facebook, and head to facebook.com/gvrivieramaya to help you win a free vacation!